I am currently working on some bathroom designs. I have lined up a few concept ideas here. 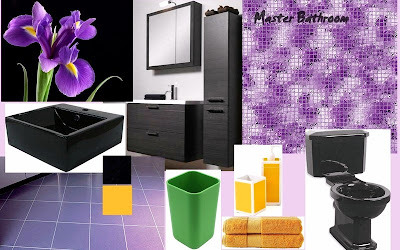 The client is insisting on colourful, bright and unique bathrooms. 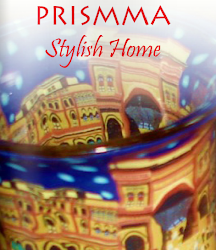 Romantic, Cosy and based on the complimentary colour scheme of the Purple Iris Flower. Retro with Graphical Patterns in mosaic, Cool colour Scheme...mostly in Aqua, yellow and white. Vasu... oh my gosh!! the sons and daughters bathrooms are gorgeous.. You are a true pro!!! 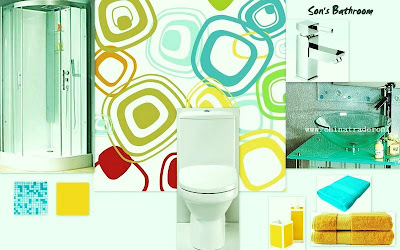 the second picture..the Aqua circles would make a good setting for the bathroom.. :)Aqua colour is too good..i like that colour. Another thing, just remembered that there was a giveaway that you had held long back in which I had shamelessly claimed for the corkscrews. Was wondering what happened? I have purchased a flat recently in chennai...and I want it done up.Shall keep you in mind. Lovely bathroom concepts. I liked the designs in your son's bathroom. How can i get that design? What are the names of the colours used? I would like to try it out in my bathroom. 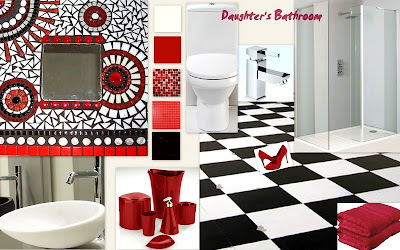 The master bathroom color scheme seems to be pretty challenging !! Looking forward to see how it would turn up finally ! The ethinic touch in all your works and pics is very exciting. Well.... i am an artist... i paint, i make murals , i do sculptures... i landscape. I do all this for over 50 x 5 star hotels worldwide(TAJ, KEMPINSKI, IKON, HYATT etc)Palaces(Muscat, rajastahn), airports ( abu dhabi)...and what i love doing enormously..HOMES. Come, together, lets create something extraordinarily beautiful.